Valentine’s Day is coming up fast, and we want to help you celebrate! We’ve got some great ideas for making one-of-a-kind cards using the perfect paper packet for Valentines: La Vie En Rose! With its elegant black and white patterns and the exquisite floral print paper, it is the perfect place to start when for creating personalized valentines for everyone—from your significant other to the kids’ teachers. We meant it when we said “little”—this mini card is ideal for all those little cuties you know! Take advantage of Valentine’s day to tell your children or grandchildren how much they mean to you, or let your kids help create a handful of these simple cards to take to school and give to their friends. 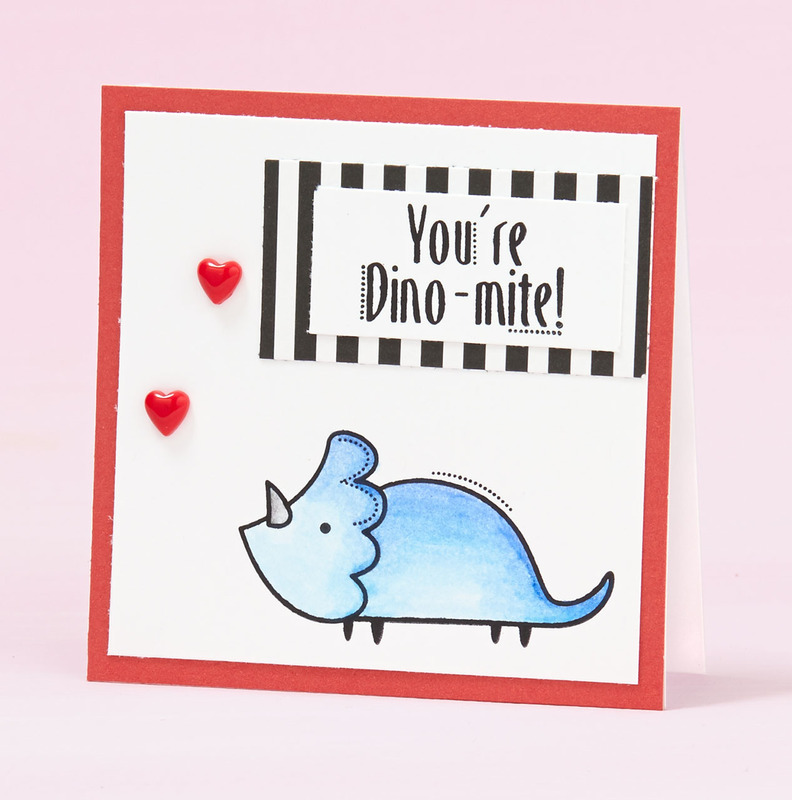 Thanks to the Darling Dinos stamp set, even boys can get in the fun without having to be too mushy about it. Chic and sweet! You don’t have to go all-out with hearts to create a lovely valentine. The two bitty hearts on this card are enough to convey, “I love you!” You might not initially think “black” when making a valentine, but it really works! We especially love the black ampersand that is accented with the help of some 3-D tape. A beautiful card like this one can add even more feeling to the words you write inside it. All right, we’ve covered kids and significant others, but there are sure to be other people who would love to hear heartfelt words of appreciation on Valentine’s Day. How about your child’s teacher, for instance? In our book, this card gets an A+! The kraft cardstock and Glacier dotted lines take us right back to our grade school days—how fun is that? Plus, that special heart stamp will be the “apple” of the teacher’s eye! 🙂 Teachers can be so influential in a child’s life, and a beautiful card like this is sure to let them know how much you appreciate their hard work. We’ve fallen in love with La Vie En Rose, and we know you will too when you start working with this paper packet. That’s why we’re going to issue a creative challenge for the chance to be featured on the blog and to win a prize! We want to see all of your lovable cards, so get excited and start crafting! Thanks, Bernadette! Welcome to our blog!